The global financial crisis of 2007 to 2009 ruined businesses and banks, individuals and even nations, and seemed to land a mortal blow to the capitalist system. But capitalism was not destroyed, rather it was irrevocably altered: the forces that precipitated the crisis are now contributing to the evolution of a new, stronger version of the capitalist model. Tracing the development of capitalism from the late eighteenth century through three distinct historical phases, Kaletsky shows how at each of these transitions the existing economic order appeared to be fatally threatened, only for capitalism to reinvent itself and emerge stronger than before. The turning point for our most recent age of capitalism came on 15 September 2008 when Lehman Brothers collapsed, setting off market chaos which, had it not been for government bailouts and guarantees, would have toppled every bank in the Western world, an incident which set off the fourth major systemic transformation in capitalism's history - Capitalism 4.0. Understanding Capitalism 4.0 will be critical to the continued recovery of our global economies. 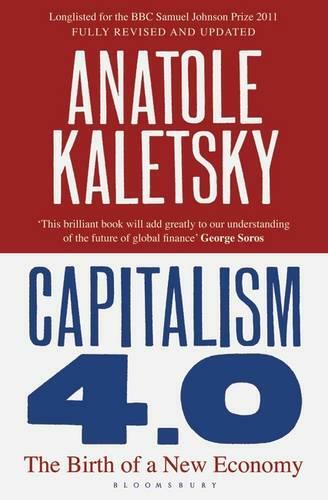 In this controversial and wide-ranging book, Anatole Kaletsky, one of the world's foremost economic commentators, puts recent financial events into historical and ideological perspective. He describes the emerging features of this new capitalist model, explains how it differs from the previous versions - and how it will change politics, finance, international relations and economic thinking in the next decade.